Bernardine Kennedy: BACK FROM SAILING THE SEAS! We arrived back on thursday but its taken until now for my brain to get back into the right gearand my body to get over jet-lag which I swear is getting worse as I get older. The first few days were spent trying to stay awake but I'm back to working today. So many mails to do deal with and Facebook stuff to catch up on as well as checking back to see what I'd written before we went away. For everyone I owe mail to.... I'm getting there! 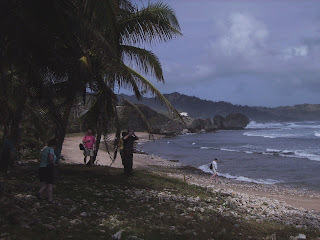 We took coach trips on Barbados, (loved the wild north east Bathsheba coast there) and Tobago where we saw an old sugar plantation and hundreds of bats as well as the statutory Fort. Everywhere in the Caribbean has forts and cannons! Also went out on a small boat whale watching off the coast of Dominica and saw loads of them, also dolphins. Its a popular area for pilot whales and sperm whales. No photos of the whales though, every time I focused the camera they dived! We were excited out of all proportion to see the tails come out of the water. Impressive creatures! Martinique was cancelled as there were civil riots (reminded me of the assorted coups when I was living in Nigeria) as was Mayreau as the sea was too rough too lower the tenders to take everyone ashore. (the ship was too big to dock there). 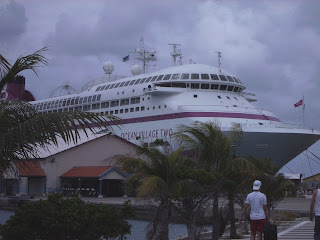 In St Lucia and St Vincent local bands came aboard; St Lucia was reggae but in St Vincent a steel band came on and they were fantastic. 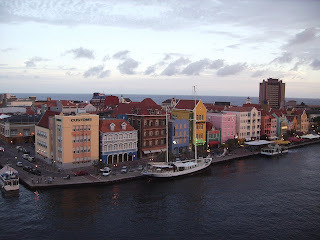 I love steel bands at the best of times but on the top deck of the ship under the stars overlooking a Caribbean vista? wow. A brilliant night, probably the best of the trip. Thats enough of holidays, apart from the photos of course! 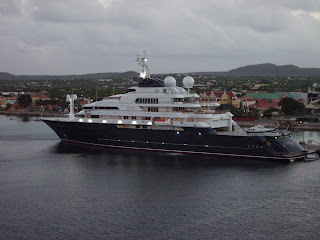 Paul Allen's 'Octopus'. Note the helicopter on the back! Classy eh? I took the opportunity of limited internet access to read a lot. I took my baby Asus PC with me but access was soooo expensive. I did go beserk and take loads of trashy magazines with me but I also read 5 books. Book of the Dead by Patricia Cornwell. I enjoy her books but this one didn't grip me quite as much. Enjoyed it though. Maybe just familiarity and I need a break from her books for a while? Hold Tight by Harlan Coben. Now he is probably my favourite right now, this was great. I loved it. Love of my Life by Louise Douglas. I knew nothing of this book or the author but the title grabbed me; romantic and sad as well as being unusual. Great first book by the author. Half of a Yellow Sun by Chimamanda Adiche. I chose this because it is about Nigeria and the Biafran War and is also a huge selling award winner. It starts at a time when I was living in Nigeria and then carries on to cover all of the war. I left when the war started but my parents stayed there for longer. This is a novel but based on fact. An interesting read. 4th of July by James Patterson. Another of my favourites. This man is just so prolific he leaves me breathless. Loved it. And that is it for the time being. apart from poor Ollie who had been battered the day before we got back by the local Thug-Cat and cost £65 in vets bills as a welcome home gift for us! grrrrrr. But he's worth it! 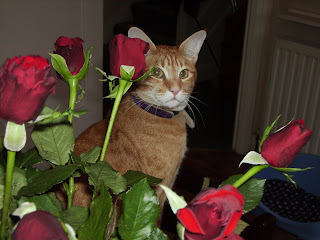 Pic is of Ollie amid the valentine roses that he thought were his! Sorry about poor Ollie but the hols sounded absolutely brilliant!